"The Toe Faerie is among the least known of the Fey. Not many toes are collected, for there is only one Toe Faerie. His name is Bert. Bert the Toe Faerie has developed an unusual method far harvesting toes. He uses a syringe to inject the larval form of a uniquely bred beast, the toehog, into the foot of his victim. There the creature works its way into a single toe, slowly grows and subtly disassembles the internal structure of the toe. 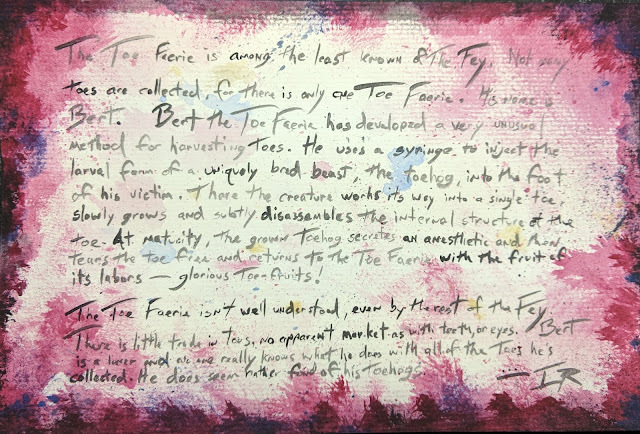 At maturity, the grown toehog secretes an anesthetic and then tears the toe free and returns to the Toe Faerie with the fruit of its labors -- glorious toe-fruits. The Toe Faerie isn’t well understood, even by the rest of the Fey. There is little trade in toes. There’s no apparent demand, as there is for teeth, or eyes. Bert is a bit of a loner and no one really knows what he does with most of the toes he’s collected. He does seem rather fond of his toehogs."